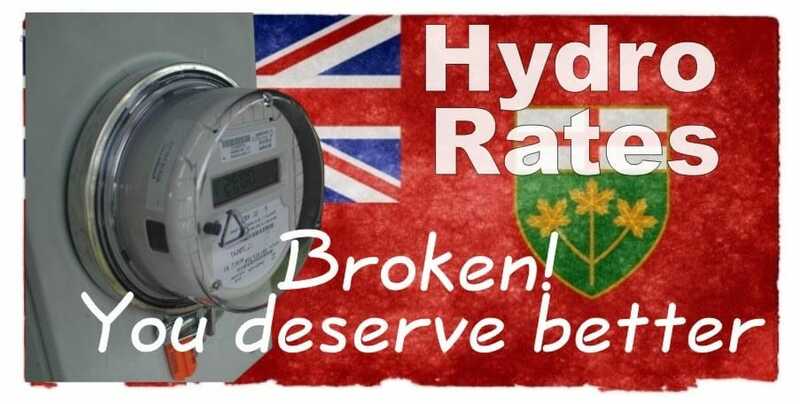 Liberal — Kathleen Wynne ? Really ? …. If you do then you are one of only 2 in 10 voters. 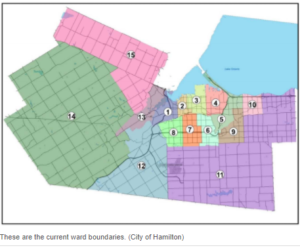 NDP — Andrea Horwath ? Well … If history is any indicator ( remember Bob Rae ) every NDP government elected anywhere has increased deficit spending and increased taxes. Conservative — Patrick Brown or Whomever ? Now here’s a guy who has knowingly endorsed nominees with stuffed ballot boxes and forged membership applications…. Is that your idea of democracy ? … Is that a trustworthy leader ? This is no joke ! 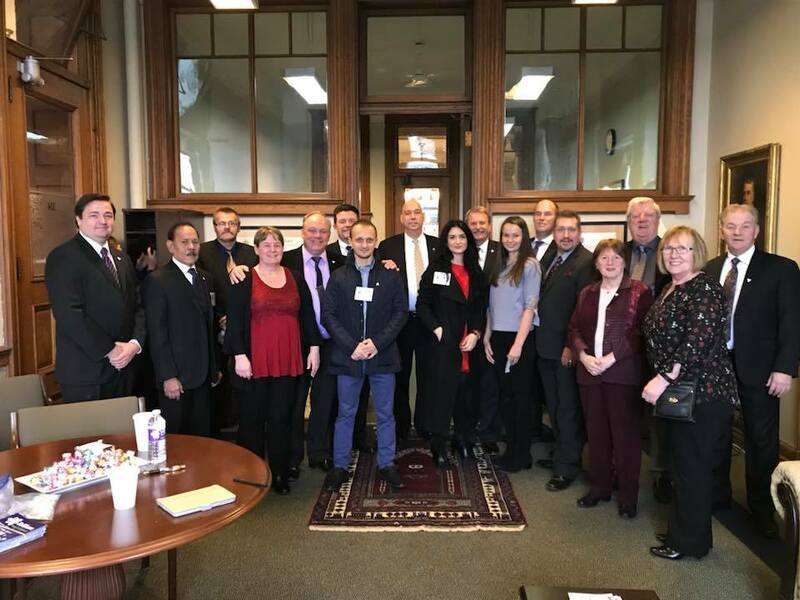 NOT ONE SINGLE CONSERVATIVE MPP STOOD UP FOR DEMOCRACY ! NOT EVEN ONE SAID THAT THIS TYPE OF FRAUD SHOULD CEASE ! EVERY SINGLE ONE BECAME COMPLICIT WITH THIS DESTRUCTION OF JUSTICE ! The Trillium Party Of Ontario – DAVID LOFT ? WHO ? …. Well.. 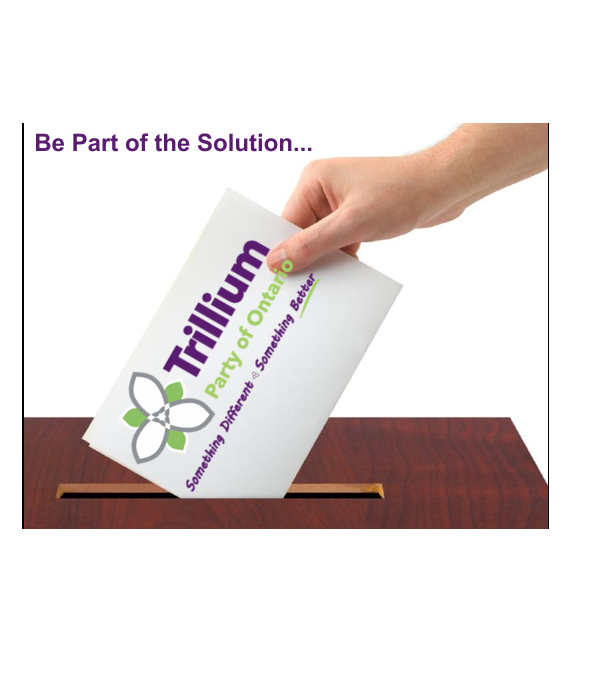 The Trillium Party was formed in 2014 to provide a party that actually listened to voters. At that time the Liberals were covering up their deleted gas plant e-mails and today senior Conservative advisors to Patrick Brown are being criminally investigated for fraud. 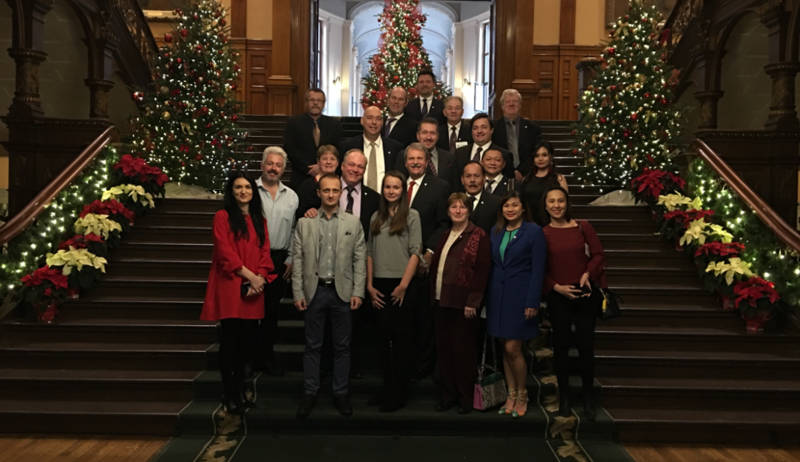 The Trillium Party is led by Bob Yaciuk, a former federal candidate and the Party already has one sitting MPP – Jack MacLaren – Ottawa. The Party is new, it is exciting and it’s committed to making changes for the better by energizing the voter’s voice. We will have candidates in over 40 ridings from across the Province. As everyone knows, the elected representatives of each of the main parties play “ follow the leader “ just like sheep. They are obligated to toe the party line .. are obligated to vote according to the wishes of the party leader and cannot in any manner whatsoever offer any criticism, private or public, of the party, the platform or the leader. I can stand up to the sitting government with total impunity. I can energize your voice in the parliamentary question period to the point of embarrassment if necessary. I can bring no shortage of media attention to your concerns. As your elected representative, I can, and will be the proverbial dog with a bone when it comes to making your voice heard and producing positive results for York-Simcoe. Personally, I’m sick and tired of government after government laying awake at night trying to dream up new ways to get into my pocketbook. 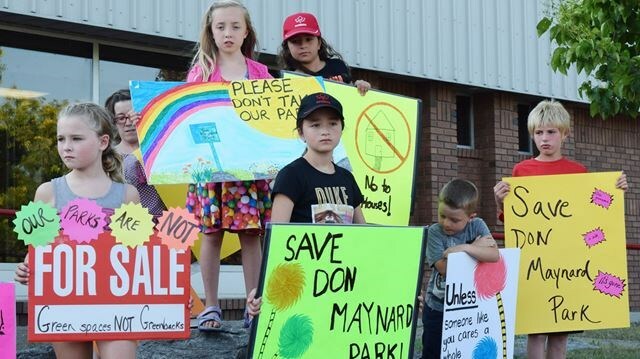 I’m sick and tired of what continually comes from Queen’s Park … supposedly on my behalf. I’m just sick and tired of being sick and tired ! …. Aren’t you ? In the most humble way possible, I’m asking for your help – I’m asking you to energize your ballot and turn it into a loud and clear statement by trusting me with your vote on June 7th. 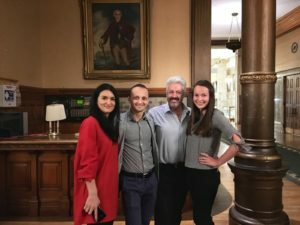 December 31, 2017 / In David Loft / By admin / Comments Off on Who Can YOU Trust? 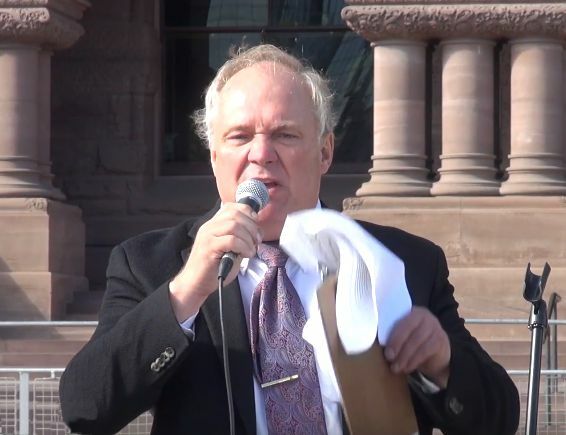 Bob Yaciuk, is the first Ontario Political Leader to take a firm stand on the selling and distribution of Marijuana. The Wynne Liberals’ plan to add thousands of government positions with an LCBO-modeled distribution system for legalized marijuana is an attack on small business and the private sector jobs it creates, and should be abandoned, say Trillium Party Leader Bob Yaciuk. and MPP Jack MacLaren. 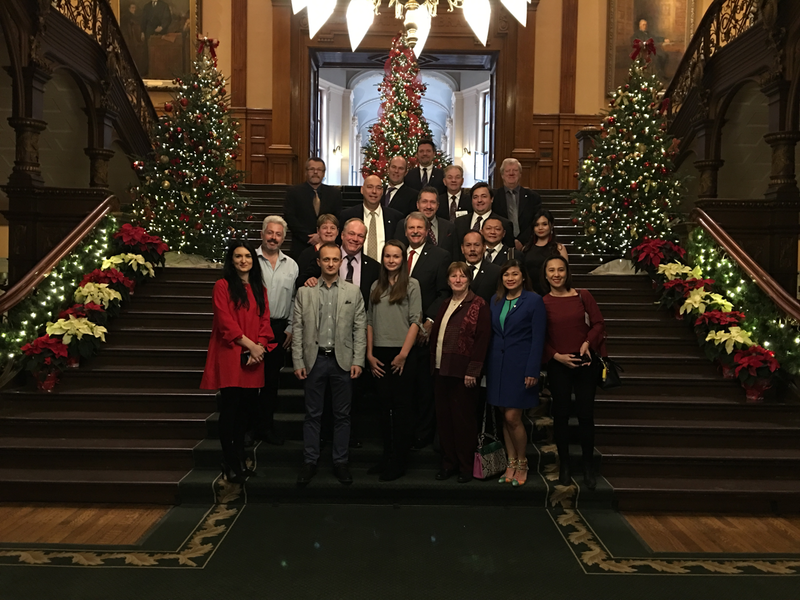 Bob Yaciuk, leader of the Trillium Party of Ontario, has formally called for a full and open public discussion of the role of solar and wind energy in Ontario – before the Ontario government extends or replaces the Green Energy Investment Agreement. The Agreement, as modified in 2013, called on KEPCO and Samsung (Korea Consortium) to design, construct and operate 1000 megawatts (Mw.) of wind-powered plants and 300 Mw. of solar generating facilities in three phases before December 31, 2016 and to manage those facilities until the Agreement formally ends on December 31, 2017. These agreements, imposed by the Liberal government, force consumers to use solar and wind-generated electricity and requires us to pay suppliers of wind and solar electricity up to 60+ cents per kilowatt hour as a wholesale price. Even the final phase of the major contract with the Korea Consortium guarantees the suppliers an absolute minimum of 10.5 ¢/kWh for wind-generated power and 29.5 ¢/kWh for solar-generated power, and the agreement with the Korea Consortium explicitly allows the price to be increased to a higher level at a later time. By way of comparison, normal wholesale prices for clean and reliable water electricity and nuclear power are in the range of about 6¢/kWh for wholesale electricity. KEPCO and Samsung were guaranteed a minimum price for the electricity that they produced. While the price that would be paid for the power produced by the last 300 Mw. of generating capacity was lower than for that produced by the earlier 1000 Mw., even that price for the solar and wind-generated electricity that would be supplied only when the wind and sun were available was much higher than is paid for clean and reliable water and nuclear-generated power. It is important that the damaging agreement with KEPCO and Samsung ends at its scheduled termination date. The OMB ruled this weekthat the city has to redraw its ward boundaries. The reconfiguration, drawn by city consultant Watson and Associates, most impacts Flamborough, Stoney Creek and the Mountain. 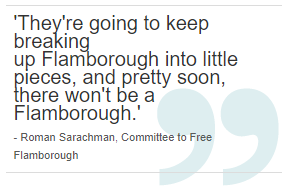 Roman Sarachman of Freelton, organizer of the Committee to Free Flamborough, says under the current system, Flamborough at least has some voting power. This just adds to the loss of identity, he said. 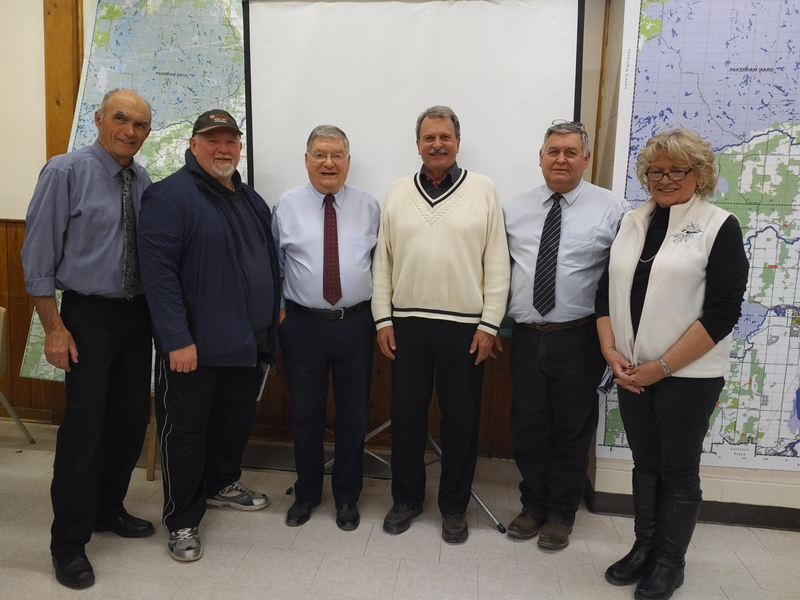 “The only rural ward in the city just got butchered up,” says Robert Pasuta, Ward 14 councillor for rural Flamborough. 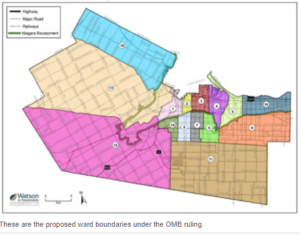 A recent Ontario Municipal Board decision on ward boundaries eliminates Ward 14 and puts the area in with Ancaster and Dundas. 250 angry people attended this the third PRATAC ( Pakenham, Ramsay, Almonte Taxpayer Advocacy Committee) meeting at the Almonte arena to talk about the unwanted ” Natural Heritage System” designation that the Town of Mississippi Mills is thinking of incorporating into their Official Plan during the OP review. From left: Brian Gallagher – President of PRATAC, Jeff Bogaerts of the Ontario Landowners Assn., Gerry Belisle – V.P of PRATAC, Jack, Bill Duncan – PRATAC, Donna Burns of the Ontario Landowners Assn. 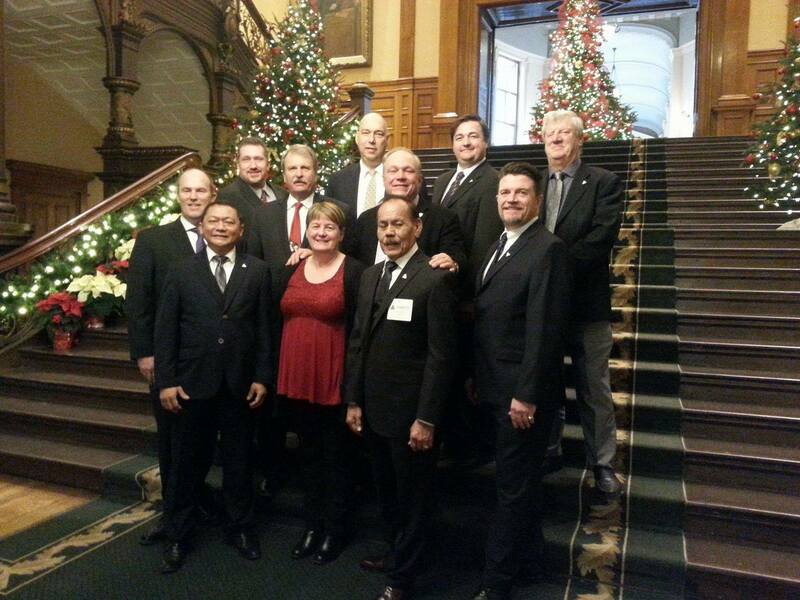 Bob Yaciuk, Jack MacLaren, and a just a few of our Trillium Party candidates and supporters at Queen’s Park. Check our website to find the candidate in your area!